Here are some samples of the magnets I made for the Fair this weekend. I think the many years I spent working in framing galleries make me feel like I need to frame everything!!! Here is an applique picture which I just completed for my Arts & Crafts Society's show and sale, which will take place this weekend. 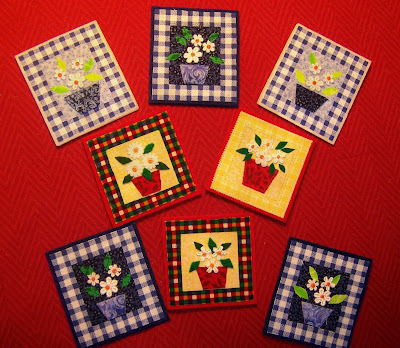 It is a compilation of motifs cut from decorator fabric samples, which are available at a local fabric store. Even the lace was a very small fabric sample! 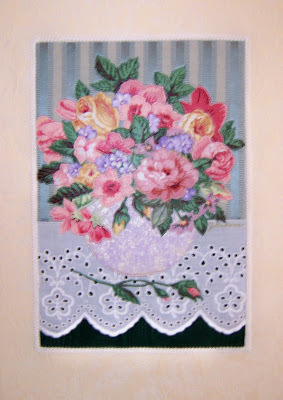 I think I cut apart three different floral fabrics and assembled the individual flowers into a "bouquet". The entire piece was simply stretched over stretcher strips and the back covered with a piece of stiff interfacing, with a wire for hanging. 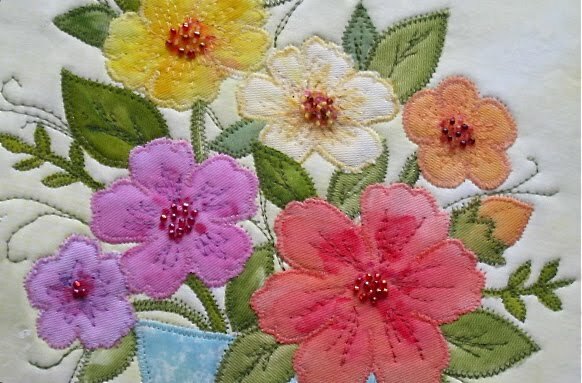 All of the picture elements were fused to the backing fabrics and sewn with a zig-zag stitch around the edges! The finished size is 12" x 16". 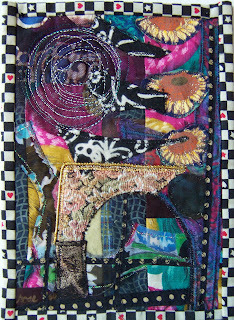 This piece was a pleasure to make with such lovely fabric samples to work with! Okay, I realize that I am more or less fixated on cats as a theme. In September I showed you a little stuffed cat, which resembled, in position and general shape, a fabric picture of my cat Kristy which I had posted in March. 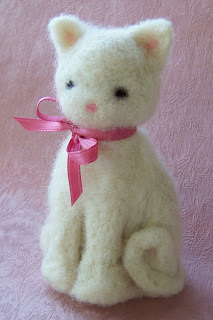 And now I am sharing this needlefelted cat which I made in a class a few days ago! Let me just say that I also like birds, people, flowers, leaves and houses as themes. Also landscapes, abstracts, faces and hands. But somehow I always go back to cats! The needlefelting class was fun. I wanted to get the feel of it so that I can needlefelt strands of colored wool roving into an applique wool landscape I had made a couple of years ago. I'm thinking it will give it a more impressionist look. We'll see! I'll post a picture of it when it's completed! Today I took a needlefelting workshop and, on the way home, stopped at a quilt show. As it was nearly closing time, I ran in and decided to quickly check out the vendors. The work at one booth looked vaguely familiar, and I soon discovered that it was the work of a friend from many years ago, Rosemary Hoffenberg. She was selling her beautifully dyed fabrics and some wonderful small wall hangings. This one caught my eye and I just had to have it! 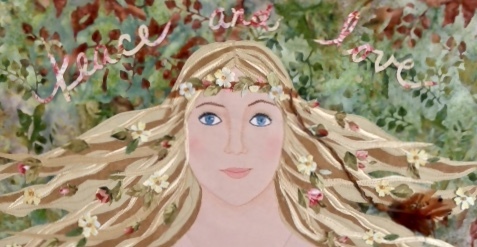 Rosemary has a great website, which you can find here. Her sense of design has always intrigued me and no one can top her gorgeous fabrics. It was great to catch up with an old friend! My wish of a few days ago came true yesterday as I went to a country fair in Topsfield, MA with members of my needlearts guild. It was a beautiful Autumn day and our focus was on the Arts and Crafts. In the needlework exhibit, a clever shirt and tie wallhanging caught our attention, as well as a beautiful felted tea cosy. 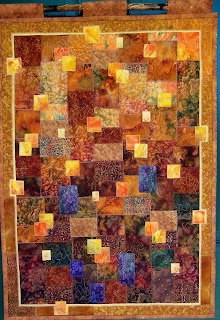 Most of the work - quilts, embroidery, counted cross-stitch, crochet, etc. - was very inspiring, and the demonstrations were well done and educational. I had never heard of bunka embroidery, but may give it a try after seeing this beautiful demonstration. This wonderful quilt was part of the Beekeeping exhibit. After seeing 4-H demonstrations, cows, chickens, floral arrangements, vegetables,etc., we agreed that it had been a fun day! This is my favorite month! I love the crispness in the air on an October day in New England. The colors of the leaves, the chill in the air, the promise of winter... I know that many people hate to see the summer end, but to me, this is the most beautiful time of year. Which reminds me, I'd better get to work on some items for my Arts & Crafts Society's Annual Fair later in the month!! I have a few projects started and will post them when they are completed!